TRIPS with everything? Intellectual property and the farming world, Food Ethics Council, Southwell, UK, November 2002. Food Security, Biotechnology and Intellectual Property – Unpacking some issues around TRIPS, Quaker United Nations Office, Geneva, July 2002. Trade, Intellectual Property, Food and Biodiversity: Key issues and options for the 1999 review of Article 27.3(b) of the TRIPS Agreement, Quaker Peace & Service, London, February 1999 – also translated into French, German and Spanish. Food and Nutrition: Creating a well-fed world, UN Food and Agriculture Organisation, World Food Day Booklet, 1992, 5 language editions. Real Security: East, West, North and South, World Development Movement, Occasional Paper 2, London, July 1990. The Turkish Wheat Research and Training Project, 1969-1982, The Rockefeller Foundation, New York, September 1984. The Development of Agricultural Extension in the Aegean Region of Turkey, Overseas Development Institute, Agricultural Administration Network, Paper 18, jointly written with Anthony Fitzherbert, London, September 1984. On-farm research for optimising potato productivity, edited with B.L. Honess, The International Potato Centre, Izmir, Turkey, 1981. Potato genetic resources and their potential for the Mediterranean region, edited with B.L. Honess and P. Malagamba, The International Potato Centre, Izmir, Turkey, 1980. The UN Food and Agriculture Organisation (FAO) was founded on October 16th 1945. Since the early 1980s, FAO has designated October 16th World Food Day as a way to raise concerns about food and farming. 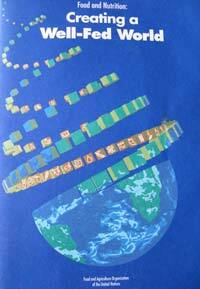 In 1992, I wrote the world food day paper: Food and Nutrition: Creating a Well-Fed World.